The Ministry of External Affairs has finalised the draft of a new Emigration Bill after undertaking consultations with line Ministries, State governments, Recruitment Agents, International Organizations, Chambers of Commerce and Industry and academic institutions. The Emigration Bill, 2019 will replace the existing Emigration Act,1983. 2. 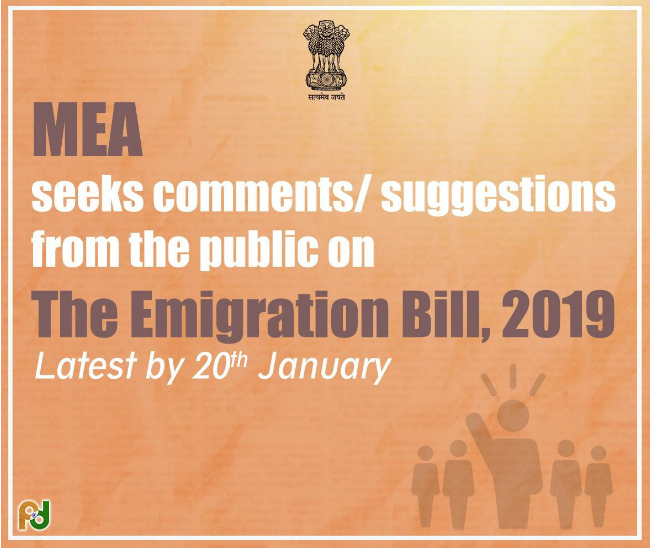 The draft Emigration Bill as well as a Note on its salient aspects has been uploaded on the Ministry’s website for seeking feedback/comments from the public and may be accessed at https://mea.gov.in/emigrationbill.htm . 3. The comments can be sent latest by 20 January 2019.